This is the very first Catch-Up week for Eating with Ellie. I missed two recipes because of Passover. 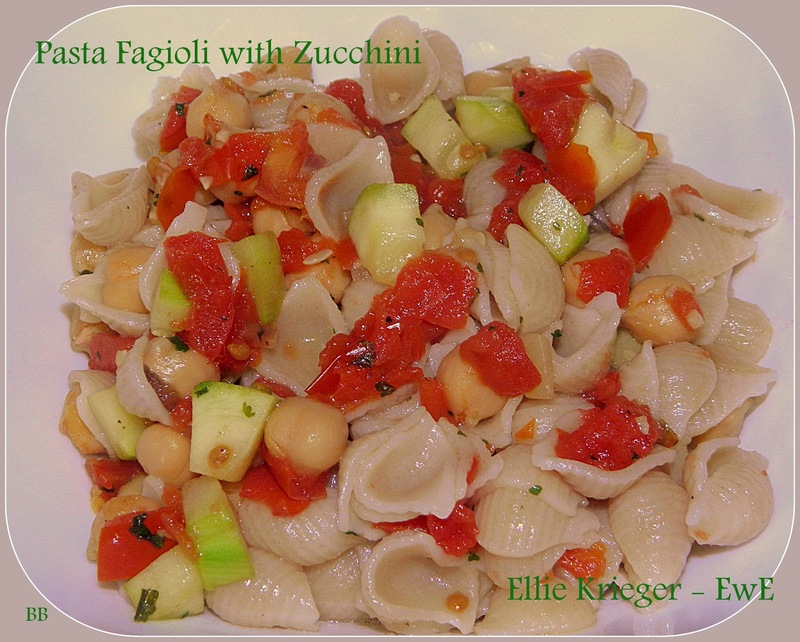 The one, I am making up, this week is Pasta Fagioli with Zucchini which I believe was scheduled for the first night of Passover (Pesach). Since pasta is one of the items, we do not eat, on Pesach, this was skipped for a very good reason. I admit, I had wanted to make it ahead of time so it could be posted but with the preparation that went into the holiday, it just didn't happen. I wish, I had the time, to let you peek into our home before the holiday. Ask any woman who celebrates Passover which is the busiest time of the year, and I would bet that many if not most, would say Passover. I learned many years ago that despite the work and lack of sleep, to enjoy this prep time. It is good to love cooking when you plan a holiday and we did cook and cook and cook. It can be healthier food if you choose to not to throw matzah in every dish. What makes it heavy is the kneidlach and matzah kugel. I keep my dishes light with lots of vegetables and it is wonderful. To sum it up, this pasta dish was not appropriate for Passover although if you take out the pasta and turn it into a veggie dish, it would be perfect and I have a feeling, delicious, as well. Check the Eating with Ellie page to see what others have made for the Catch-Up dish, this week. Feel free to take a look at our recipes and make one and then link up at Eating with Ellie (EwE). We would love your company. Looks delicious. It is interesting and fun to learn about your holy days and preparation for them, I always like learning new things!